This is a significant escalation by John Podesta. It is increasingly clear he wants his candidate to be asked about the ET issue in debate or town hall. Mr. Podesta again makes it clear Secretary Clinton's public comments on the extraterrestrial issue are no joke. He seems to indicate she will ask for all ET related records in government files to be declassified. That would, of course, trigger Disclosure, assuming the Pentagon does not commit treason and deny her any of these records. He reconfirms he has her promise to act on the matter. Tapper then tries to take Podesta back to his time with President Bill Clinton coming close to the matter of the Rockefeller Initiative. Podesta responds, but avoids the Rockefeller Initiative. The moment the words "Rockefeller Initiative" come out of the mouth of either John Podesta or Secretary Clinton, the media are finally unleashed to engage the issue in full. Podesta uses the phrase "legitimate questions." Legitimate questions implies legitimate issue. If the ET issue is legitimate, then it must be included in the presidential campaign. 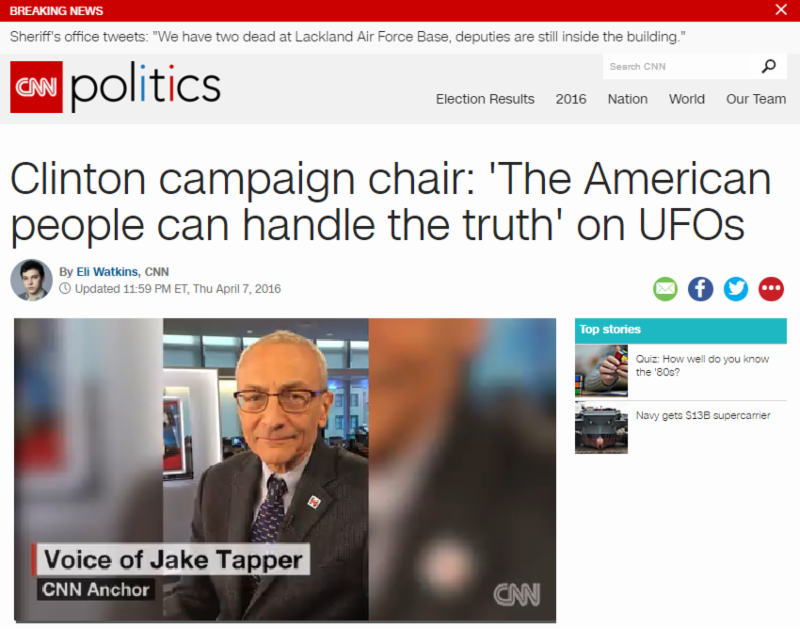 Podesta also uses the correct phrase "unidentified aerial phenomena" (UAP) to distance himself from UFO, which is the truth embargo acronym. Here he is following the lead of the Disclosure movement. Once again he repeats the "American people can handle the truth." This phrase - his signature phrase - is not relevant unless that "truth" is profound. Lastly, when asked his opinion on the extraterrestrial presence, his clever response leans toward "yes." JUST EXACTLY WHAT MORE DOES JOHN PODESTA HAVE TO DO BEFORE THE DEBATE/TOWN HALL MODERATORS ASKED HIS CANDIDATE, SECRETARY CLINTON, ABOUT THE ROCKEFELLER INITIATIVE? For an extensive compilation of political media coverage of the extraterrestrial presence issue go HERE.